Driven by competition and consumer demand, the electronics industry continues to make smaller, higher performing, and more efficient equipment and subassemblies. As engineers make electronic components smaller, they are challenged with the task of managing heat dissipation without sacrificing performance or cost. Until recently, accurately understanding heat loads has been extremely difficult. 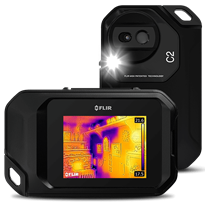 However, with innovations in thermal imaging, engineers are now able to easily visualize and quantify heat patterns in their devices. SynQor, located in Hudson, MA, developed the PowerQor dc/dc converter, a uniquely designed, high-efficiency, high-density, modular power supply. Unlike traditional converters, the PowerQor does not use a heat sink or baseplate to dissipate heat. Their efficiency is so high that the SynQor converters provide more usable output power without a heatsink than traditional converters with a heatsink assembly. In early development stages, SynQor used thermocouples to measure temperature variations in their power converter design. In some instances, thermocouples worked fine. However, since heat patterns are difficult to predict, it was not always possible to know exactly where to attach the thermocouple(s) necessary to make accurate measurements and effectively evaluate heat dissipation. 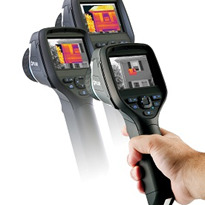 Time-consuming and inaccurate, SynQor began searching for alternatives to thermocouples and turned to thermal imaging to help design and characterize their products. "The name of the game in this business is thermal performance," said Josh Bretz, Design Engineer for SynQor. "The bottom line for the customer is how hot the converter gets, given a certain environmental condition and power level." When presented with a customer application specifying ambient temperature, air speed, and the orientation of airflow over the converter, SynQor can simulate precise customer environmental conditions and provide them with an exact thermal profile. To do this, SynQor mounts the converter on a PCB in a wind tunnel as thermal images are taken with a FLIR Systems ThermaCAM. The remote temperature interface installed in the ThermaCAM and the wind tunnel’s closed loop feedback system automatically records temperature and other data necessary to generate power-derating curves. Power-derating curves show how much power a dc/dc converter can deliver as a function of the ambient temperature and airflow velocity. Using the ThermaCAM, SynQor captures temperature data for their power-derating curves, which are included in each product specification sheet. 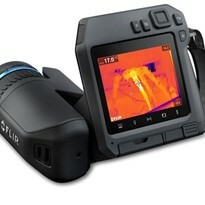 Engineers at SynQor also make extensive use of IR imaging early in the product design cycle. "In development work, it is very helpful to get immediate feedback on the amount of output power and the power being dissipated. 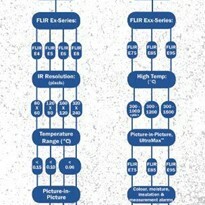 At SynQor, we have found that the best way to locate the power loss in circuitry is by using an infrared (IR) camera. 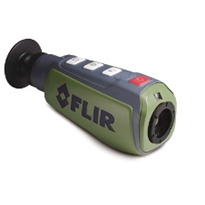 With IR, you can see where the power loss is and address that part of the circuit immediately," noted Josh Bretz. 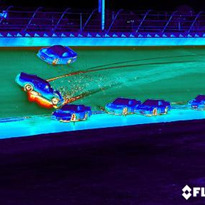 In 1997, SynQor purchased their first thermal imaging system, a FLIR Systems ThermaCAM. 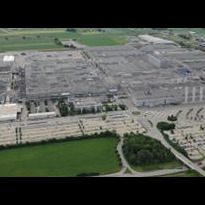 "Through IR, we have learned how to optimize the design to make all of our products more efficient," said Bretz. "In early development work, the ThermaCAM helped us find something that was hotter than expected," commented Bretz. High resolution, instant non-contact temperature measurement, and remote temperature interface were the primary reasons SynQor purchased the ThermaCAM, which served SynQor on several levels. "If we were just using thermocouples and attaching them where we thought it was going to be hot, we would not have caught something glowing on the other side of the board; this happened to us more than once," said Bretz. SynQor required an infrared camera that would not only help them with their current designs, but one that would grow with them and be able to provide an accurate understanding of thermal performance and heat dissipation in future designs. The ThermaCAM offered SynQor the reliable temperature measurement and analysis capabilities they needed. 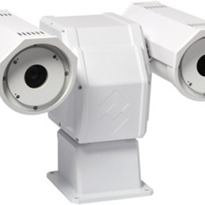 The ThermaCAM’s patented solid-state microbolometer sensor, the most reliable IR camera technology available, provides longwave performance and produces real-time (60Hz), crisp, colour thermal images with more than 76,000 individual measurement points per image. Fully self-contained and easy-to-use, the ThermaCAM features on-board PC card digital image storage and automated image analysis features. 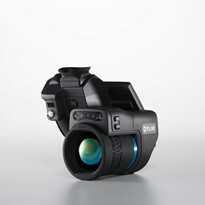 A variety of lenses and remote control and data output options are available to customize the system to SynQor’s varying non-contact imaging and measurement scenarios. 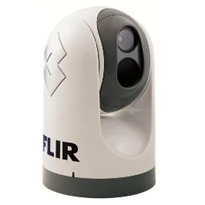 Coupled with FLIR’s ThermaCAM Researcher or Reporter Software, the ThermaCAM also provides extensive post-processing and analysis capabilities. 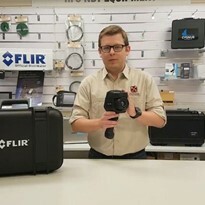 "By using the FLIR Systems ThermaCAM, we can now provide our customers with a level of temperature data never before published in the power supply industry. This data is so useful to our customer that they now demand this data from our competitors," said Bretz. 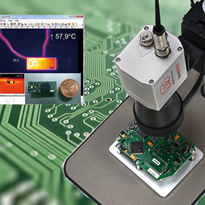 Now that SynQor has implemented thermal imaging as an integral phase of their design process, SynQor has taken temperature analysis to an unprecedented level in the dc/dc converter industry. 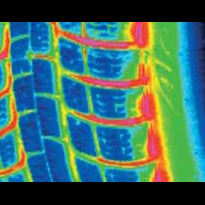 Thermography provides an extremely accurate and reliable method to see, measure and document heat dissipation and thermal performance. Unequivocally, the ThermaCAM has proven to be a cost-effective alternative to thermocouples and other temperature measurement systems, dramatically improving quality and productivity at SynQor. Thermal imaging, also called thermography, is the production of non-contact infrared or “heat” pictures from which temperature measurements can be made. 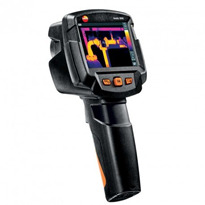 Portable infrared cameras scan equipment and structures, then instantly convert the thermal images into pictures in a JPEG format for monitoring and analysis. Thermal imaging increases efficiency and maximizes safety in many industries and environments and is rapidly expanding into new markets.